Image caption Police in Northern Ireland are experienced at dealing with street violence - but some people worry they will be 'heavy-handed' with anti-G8 protesters. With the G8 summit two weeks away, security is being tightened in County Fermanagh and across Northern Ireland. Some protesters fear "heavy-handed" policing as prison cells have been cleared in anticipation. Northern Ireland has specific laws and crowd control measures that evolved over years of political conflict. Police said they "will uphold the right to peaceful protest" but there will be "consequences" for any protesters who break the law. Since it was announced that the leaders of eight wealthy and powerful countries would be visiting a rural Northern Ireland golf resort, resources, thought and money have been poured into policing the event. More than 100 cells at Northern Ireland's high-security prison, Maghaberry, have been set aside for any violent protesters over the two-day event. Surveillance drones have been bought and 3,600 police officers from other parts of the UK are being drafted in to work alongside the PSNI (Police Service of Northern Ireland). Some have been trained to drive the armoured vehicles used by police in Northern Ireland. Couples have even been told to plan extra time to get to weddings in Belfast - in case anti-G8 protesters surround the City Hall. "It would be very foolish if we did not plan for the potential of significant trouble," the Northern Ireland justice minister, David Ford, has said. He has also told the Assembly at Stormont that "lawful, peaceful protests" would be facilitated. Seattle, 1999. Hundreds of people were jailed after violent protests against the World Trade Organisation. Genoa, 2001. Anti-G8 protests turned violent and a demonstrator called Carlo Giuliani was killed by police. Gleneagles, 2005. Some people were arrested but a Make Poverty History campaign march passed off peacefully. London, 2010. Passerby Ian Tomlinson died of a heart attack after being hit and pushed by a police officer during anti-G20 protests. Some protesters and human rights activists are worried, however, that police may use powers designed for anti-terrorism in a "heavy-handed" way. The Committee on the Administration of Justice (CAJ) is planning to send human rights observers to the G8 protests to monitor the police. If protests do turn violent, deputy director Daniel Holder hopes the police response will be only what is "necessary and proportionate". He said the CAJ was "firmly and absolutely opposed to the use of plastic bullets" that the group said had been fired on 12 occasions in Northern Ireland over the past year. It was a year marked by violence at protests after the annual Orange Order parades in July, but also by widespread loyalist protests in December, some of which turned violent, after Belfast City Council voted to stop flying the Union flag over the City Hall every day. Some counter-terrorism laws are specific to Northern Ireland. Police and soldiers can stop and search people for munitions and transmitters without having to prove they had "reasonable" grounds to be suspicious as they would in England, Scotland or Wales. Another characteristic of Northern Ireland law is that police must be notified of any planned parades or marches, except funeral processions and those held by the Salvation Army. This is to allow the Parades Commission, set up as part of the peace process, to talk to local communities and set rules for the parade if it is contentious or likely to prompt violence. Taking part in a parade that the police do not know about is a criminal offence in Northern Ireland and can carry a prison sentence. 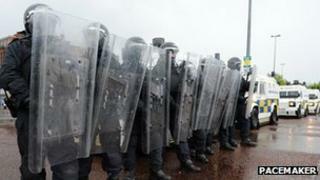 "It would be an abuse of these powers if they were used just to obstruct protests," Mr Holder said. "If they are widely deployed for purposes well beyond the use of what seems reasonable, then serious questions will be asked." There is, of course, a reason why such strong counter-terrorism laws exist in Northern Ireland - conflict continues. The threat from dissident republicanism is still judged to be severe. But organisers of an anti-G8 protest planned for the first night of the summit fear the dissident threat is a "perfect excuse" for "repressive measures" against protesters. "We have nothing to do with that type of violence, individual terror attacks and such," said Gary Mulcahy of the Socialist Party at a protest planning meeting in Belfast. "We're opposed to those methods, which actually hand the establishment a perfect excuse to try and justify the repressive measures that they're preparing to use against us." He said that the numbers of protesters and levels of violence would be lower than at previous anti-capitalism protests. "Because we don't have a major anti-capitalist movement, the G8 summit which is going to happen in a few weeks here is going to be quite different from the likes of Genoa and Seattle in the past," he said. Steven Agnew of the Green Party, who represents North Down at Stormont, said: "I certainly have concerns when you prepare for an event that the first thing you do is set aside a wing of a prison," he said. "That suggests a heavy hand. If you go in heavy-handed to begin with, you are more likely to get a violent response." A PSNI spokesperson said the police have already been in contact with campaign groups, in keeping with their goal to "uphold the right to peaceful protest". He appealed for protesters to get in touch and discuss their plans. "Our aim is to work with people so they can make their point or raise their issue, whilst ensuring the safety of all involved and minimising disruption, not least to the local communities who are most directly affected by this event," he said. "Everyone has the right to peacefully protest and police will endeavour to facilitate that right where possible, providing protesters remain within the law. However where protest activity is unlawful we will take action and there will be consequences for those breaking the law. "The PSNI is committed to playing its part in ensuring that the summit passes off peacefully and that nothing detracts from this opportunity to showcase Northern Ireland to the world." The PSNI has said that police officers brought in from outside Northern Ireland will be under the control of the PSNI's chief constable and held accountable by the Police ombudsman. Thousands of people are expected to attend a separate set of protests and events with the Church-backed anti-hunger campaign, Enough Food For Everyone IF. Phillip Graham of Oxfam said the campaign's relationship with police "should be fine". The G8 summit brings together the leaders of the US, UK, Canada, Russia, Germany, Italy, France and Japan.